Coffee Can Help You Look Great. Great news. Coffee is actually good for you. 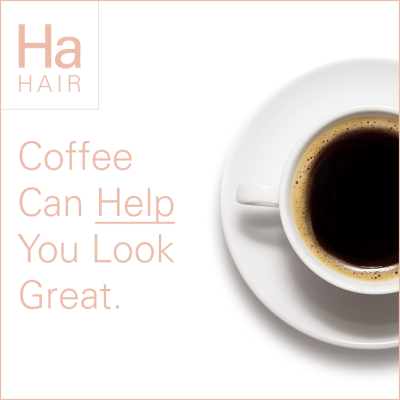 As well as being loaded full of antioxidants and nutrients such as riboflavin (Vitamin B2), manganese, potassium, pantothenic acid (Vitamin B5) and magnesium which is good for optimum health, coffee can also make a huge difference in the way you look. Here are just a few ways you can harness the power of java and add caffeinated goodness to your beauty regime. diuretic to reduce swelling and puffiness. Blast cellulite. Improve the appearance of cellulite in as little as two weeks by mixing together coffee grounds and coconut oil. Apply the mixture to the troubled spots and leave for a few minutes before washing off. The exfoliation and massage help stimulate the blood flow and tighten the skin. Colour your hair. Who said that blondes have all the fun? Brunettes, if you mix a tablespoon of coffee grounds in to your favorite conditioner and let it sit on your hair for around 5 minutes then you’ll find that it goes a deeper shade and will last until your next shampoo. reduce your stress levels and help you feel relaxed. After 60 seconds rinse, wash, and condition. You’ll feel great and your hair will be shinier than ever. So as well as a delicious wake up, your cup of coffee also serves as a great beauty tool. Pass us an Americano. Stat. 2 Responses to Coffee Can Help You Look Great. Hi Carla, excellent tip – thanks ? Pls specify which coffee grounds. Is it Nescafé or fresh beans ground, if beans then which kind? Great Q! Freshly brewed coffee grinds of any kind would work. I believe Nescafe does make a coffee that is ground opposed to instant. Instant granules wouldn’t work because they are freeze dried mostly and will melt away. You need the grinds to help exfoliate the skin.